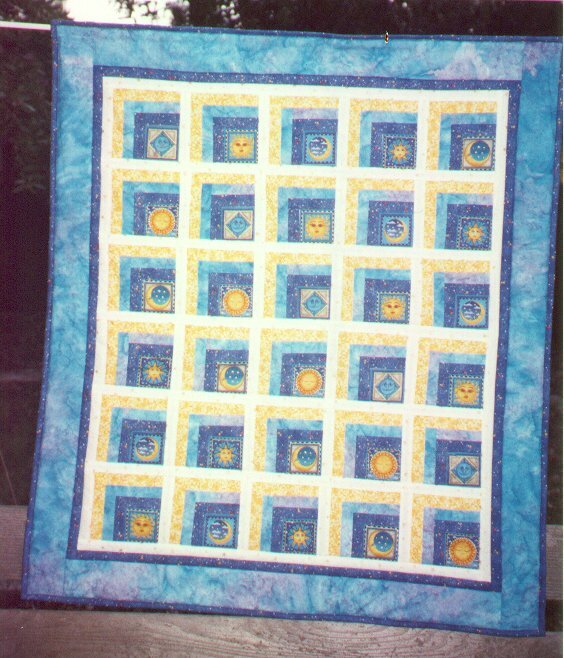 The quilt is made up of 30 blocks framed by a sashing, then surrounded by 2 borders and finished with a simple binding. The finished dimensions are 40"wide x 45"long. The pattern is called "Log Cabin in a Window" and is a combination of Log Cabin and Attic Windows. In this case, the perspective is going from the upper left-hand corner to the lower right-hand corner. (I think, however, that I should have reversed the color sequence of the "log" layers and gone from dark -> light instead of light -> dark as I did on this one). then bordered 3 times on the top and left-hand side by 3 "logs" for each layer. The first layer is a dark blue background w/ very small multi-colored stars. The next layer is a blue/lavendar tie-dyed fabric. 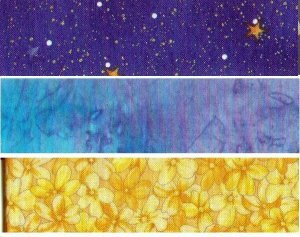 The last layer is a brightyellow mini-floral fabric. The sashing that connects all the blocks together is off-white w/ small metallic gold stars. The first narrow border and the binding is the same fabric (dark blue w/ small multi-colored stars) as the first layer of "logs". The second wide border is same fabric (blue/lavendar hand-dyed) as the second layer of "logs". The backing of the quilt is black w/ gold metallic stars of various sizes and styles and crescent moons. Addendum: let's fast foward to 2012. Basic arithmetic will tell you that 13 years have passed. Has the memory quilt been worked on?